For the past year or so, we’ve had a meat club subscription from (to?) Marin Sun Farms. Lately-- say the last 3 months or so-- “the box” has become our sole source of meat. No extra steak, no sausage for the heck of it, no chicken breasts cause I feel a little lazy. While it can be a little burdensome/constraining (the meat is frozen and we don’t have a microwave, and our freezer is pretty small, plus, I do like a chicken breast on a whim once in a while), it general it’s been really great. The subscription has allowed me to keep really close watch on our food costs. And I feel good about knowing exactly where all our meat came from, that it is humanely raised with no freaky hormones/drugs. And, it’s the best lamb I’ve ever had, close to perfect pork, excellent steak, and wonderful eggs. What has surprised me more is how the box has affected my cooking habits and recipe experimentation. We get a package that includes about 5 lbs of ground meat and 2 lbs of “steaks” (steak, but also pork chops, lamb chops, chicken breasts, etc.... so far,though, we’ve only ever gotten steak). That is a lot of hamburgers if you break 5 lbs down to 1/4-1/3 lb per person. And 2 lbs of steak across 2.5 people works out to weird portions, too. So, now we have a weekly burger night-- we’ve gotten to the point where it’s homemade burger, homemade ketchup, homemade pickle (actually I like Happy Girl's better than my own...), homemade buns (M makes them-- fabulously-- using this recipe). I haven’t tried making mustard yet. But it’s a fun game, just how much of it can we make ourselves-- it relieves what for me would otherwise be the tedium of having to eat a burger every week. And I’ve gotten pretty good with making beef tacos, we have nachos, I mix some beef into a version of bolognese (I guess I really should call it sugo). But we still have a freezer full of ground beef. I am thinking maybe we need to have a hamburger party. With the ground pork, I’ve learned how to make chorizo verde, created a vietnamese burger recipe, and eaten way to many pork balls (my childhood favorite). Meanwhile, steak is on the other end of the spectrum. M loves steak and would happily eat a pound to himself every week. However, he’d rather have a steak every week than the whole pound-- frequency is more important than quantity. So I prepare 1 or 2 packages a week (depending on the portion size packaged, which can really vary) carefully, and make interesting side dishes, and a desert. On hot weekends (all three of them!) this has been sunday dinner: some homemade hummus and toasted pita, a few roasted peppers eaten with a glass of wine while the rib eye or new york strip marinates; boiled new potatoes with lots of salt and cracked coriander, anchovy butter for the steak, cherry tomato and sliced green bean salad, walnut cake. Ironically, after this sort of meal we often end up with leftover steak. Which we all love in a lentil salad for a quick supper later in the week, or for a picnic lunch on Saturday. For me, lentil salad is one of the emblematic foods of summer. And it is perfect for a picnic-- bright and tangy, but packing a protein punch-- good fuel for a few more hours of swimming or hiking, and no carbs to slow things down (the midday summer sun is enough to make me want to nap, anyway!). Sort and rinse the lentils: depending on where you got them,there will be some pebbles mixed in here. I live black (beluga) or green (de puy) types of lentils the best. I don’t think you are supposed to, but I mix a little of each together to get to 1 c.
Put the lentils in a sauce pan and cover with about 3 inches of water, bring to a boil. Turn heat down to a simmer, and cook, without a top. This step is really variable-- some lentils cook in 10 minutes, others in 30. Set a timer for 10 minutes and check every 5-10 minutes after that. When they are done, drain loosely, i.e. it’s ok for the lentils to be damp-- don’t be too aggressive, you want some extra water. 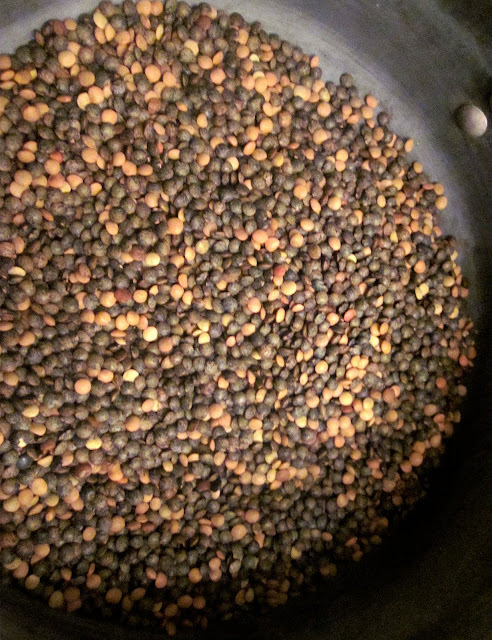 Immediately toss the lentils with 2 tbs red wine vinegar salt and pepper-- this sort of locks in the flavors, I think the lentils absorb some of the vinegar and it keeps them from turning to mush. Let sit while you chop up the other ingredients. Add the olive oil, shallot, 2 tbs more vinegar (or less, to taste-- and here I prefer tarragon vinegar to red wine, gives it all a little kick), parsely and steak. Stir to combine. goat cheese (1/4 c) + tarragon or parsley + shallots + your choice of vinegar. I haven’t tried it with chicken breast, but I don’t think it would be a great flavor/texture combination. You want a protein with a more robust flavor and a defined texture-- in fact, I’d go easy on mixing in the salmon for that reason-- ust lightly, and ad the end, after all other ingredients are in and seasonings adjusted.